Farrar, Straus and Giroux, 9780865478015, 256pp. Self-help books don't seem to work. Few of the many advantages of modern life seem capable of lifting our collective mood. Wealth—even if you can get it—doesn't necessarily lead to happiness. Romance, family life, and work often bring as much stress as joy. We can't even agree on what "happiness" means. So are we engaged in a futile pursuit? Or are we just going about it the wrong way? Looking both east and west, in bulletins from the past and from far afield, Oliver Burkeman introduces us to an unusual group of people who share a single, surprising way of thinking about life. Whether experimental psychologists, terrorism experts, Buddhists, hardheaded business consultants, Greek philosophers, or modern-day gurus, they argue that in our personal lives, and in society at large, it's our constant effort to be happy that is making us miserable. And that there is an alternative path to happiness and success that involves embracing failure, pessimism, insecurity, and uncertainty—the very things we spend our lives trying to avoid. Thought-provoking, counterintuitive, and ultimately uplifting, The Antidote is the intelligent person's guide to understanding the much-misunderstood idea of happiness. Oliver Burkeman is a feature writer for The Guardian. He is a winner of the Foreign Press Association’s Young Journalist of the Year award, and has been short-listed for the Orwell Prize. He writes a popular weekly column on psychology, “This Column Will Change Your Life,” and has reported from New York, London, and Washington. 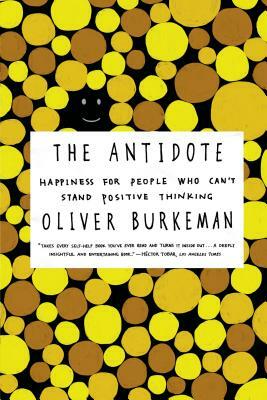 He is the author of The Antidote: Happiness for People Who Can't Stand Positive Thinking. He lives in New York City.